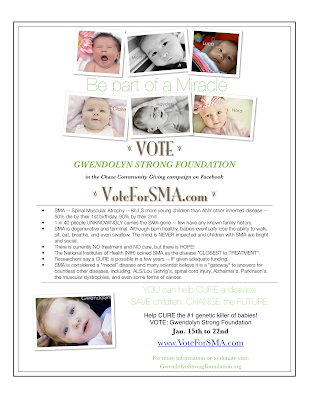 We LOVE your ideas and your commitment to fighting for this $1M for SMA research and awareness. We cannot tell you how much it means to us to hear that you are in this with us. We are just two people, so we can not do this alone. We received this enormous opportunity to win a $1M grant because of incredible wide ranging support, but now we need even more. And because you can only vote for GSF one time in the final round, we need to dig deep and work extra hard to get beyond our networks and reach new people to vote for GSF. With your help, together we WILL see an end to this cruel disease! So, in addition to VOTING, please commit to at least 3 things YOU will do from January 15th to January 22nd. BE ANNOYING (we mean persistent:) ALL WEEK LONG! In addition, here are some of the creative plans brewing by our supporters. Will you go the extra mile by doing one of these, too? Flyer ---> Download, print, and pass out our campaign flyer. This is especially useful for large groups or people who you don't have email addresses for such as schools, churches, and businesses who you have a personal relationship with. Click here to download the flyer. Make it Easy ---> Two of our night nurses also work at a clinic and for round one of this competition, they helped GSF by having their computers open to the voting page - http://VoteForSMA.com - and telling every nurse or doctor they saw to vote. Each person had to log in, but that was it. Simple and brilliant! And this time, my dear friend is setting up a voting station at her local mall. Could you set up a voting station at your work or somewhere in your community??? Contact Groups + Organizations ---> People have asked the organizers of groups they belong to to get involved by emailing a personal plea with the link - http://VoteForSMA.com - to sorority lists, mom's clubs, company lists, book clubs, alumna and professional organizations, etc. potentially reaching thousands of members! Do you belong to a group who would send an email to its members??? Direct Message Facebook Friends ---> Since this is on Facebook, a direct message with a personal plea to all of your FB friends goes a long way. So in addition to posting it on your status, send an email to every Facebook friend. In fact, on http://VoteForSMA.com there is a button that reads "Invite a Friend". By simply clicking this and checking the boxes, you can message your FB friends to vote for GSF. Will you take this extra step??? Contact BIG bloggers ---> Several people have or are planning to contact bloggers with a large following they think would be a good fit. Imagine if hundreds of people blogged about GSF and posted the video! Do you know any bloggers you can ask to help??? Get Students Involved ---> One teacher incorporated GSF into her lesson on "grassroots" and posted the voting link - http://VoteForSMA.com - on the board for her students to write down and visit at home. They are excited about making a difference. Come Jan. 15, I smell a homework assignment Do you know any high school or college students willing to campaign for us on Facebook??? No need to ask our permission on anything you do. Just Do It! We NEED your help. AND THANK YOU SO VERY, VERY MUCH!!! GWENDOLYN THINKS YOU ALL ROCK!! !